Making homemade slime has been on my list of things to do with Bryson for quite a while. Finally with Valentine’s Day right around the corner, I thought it would be the perfect time to give it a try. Even better, when I asked Bry which color he wanted to use, he chose pink. It turned out more red, but I can’t think of a better color to rep Valentine’s Day! – Dissolve 1 teaspoon Borax in 1 cup water. Set aside. – In a medium size bowl, empty your glue. 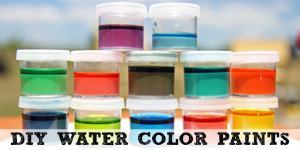 – Then, fill your empty glue bottle with water and pour it into the bowl of glue. – Add food color of your choice and stir well. – Pour the Borax mixture into the glue mixture and combine. – Stir with a spoon, you’ll start seeing gobs immediately. – Put the spoon aside & finish kneading the slime with your hands. It’s fun! – Dump the excess water out & continue working the slime. The wetness will go away and it’ll be dry to the touch. Voila! That’s really it and it’s so fun to make and then play with. 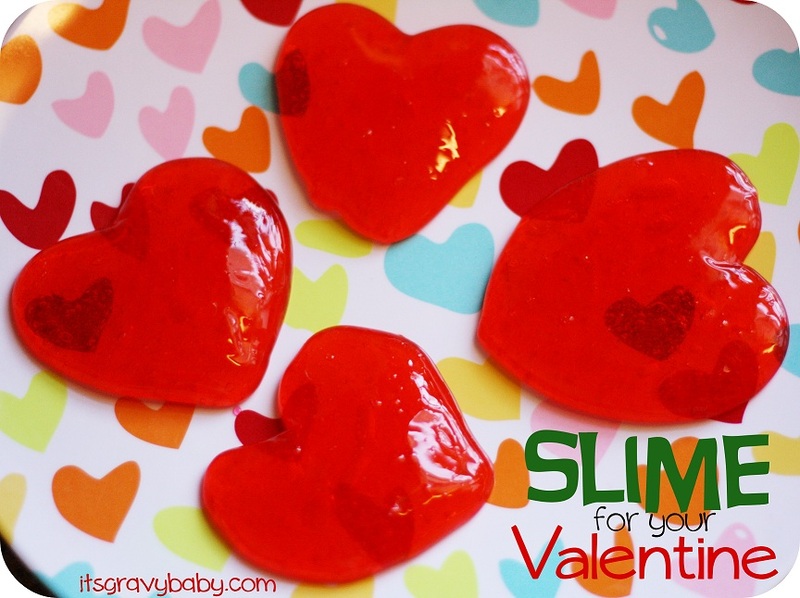 To make valentines, you could divide the slime into smaller portions, wrap it in treat bags or put it in plastic jars, and add a clever little note. Kids would love it! Keep in mind that this is obviously not edible, so only make this with children that understand that and supervise any smaller children closely. Miss Bella Grace thought it looked tasty and tried to get a bite quite a few times! Homemade play dough would be a much better option for the little ones. Are you making homemade valentines this year? 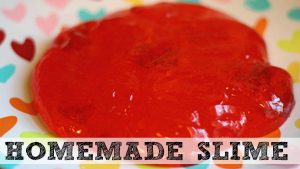 Let me know if you give this homemade slime recipe a try! I LOVE THIS!!! 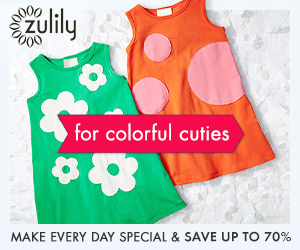 My Bitzy is a young 2 (27 months), and I’m desperate to find fun crafts for us. This is PERFECT. Thank you so much! 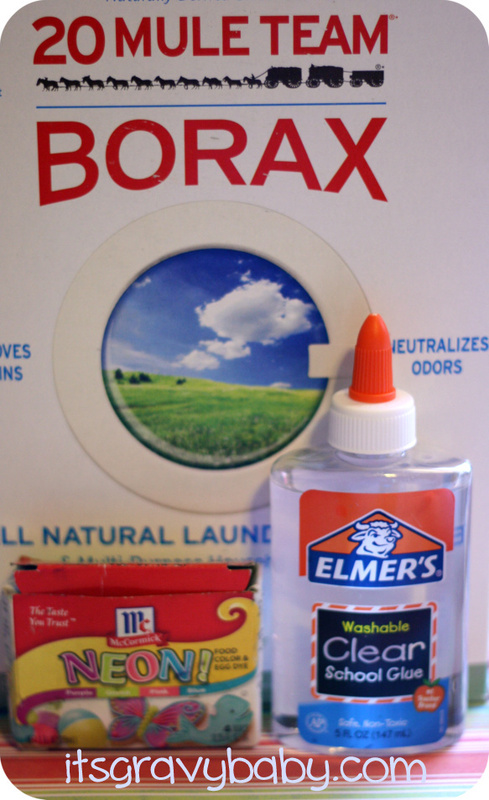 I am buying the borax right now (well as soon as I get out of the car and walk into Target) and we are going to try it this afternoon! Make sure you’ve got some glue on hand too. Let me know how it goes! It works great not very stretchy, but is so soft and squishy and fun to play with! How much of everything do you use?? I guess I know what our next project will be! This is sooo cool, thank you for sharing. I know all three of my kids would love to make this! I have always wanted to make this stuff! 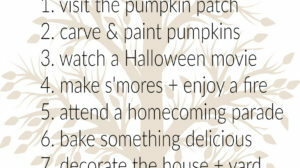 i did this at a girl scout thing but making it at home will be more fun! Yet another reason I need to get some Borax. What a adorable (slimy) craft. Thanks for sharing your tutorial. OMG this is brilliant! I love it. I hope you will link this up to my I Heart Projects Party if you haven’t already. How much glue do you use? Just dump an entire bottle of glue (5 fl oz) in there. Does it matter if the glue is washable? What about off brand glues?! I haven’t tried an off brand, but I don’t know why it wouldn’t work. I’m not sure if it has to washable glue either, I’ve only tried Elmers- both clear and white. Let me know how it goes for you! Just wanted to let you know that I was doing dome research the other day and found that borax is toxic and especially harmful to pregnant women and their unborn babies. It does seem like a really neat craft though. Perhaps there is a safer alternative to using the borax. Thank you for your comment, Katherine. Borax is a naturally occurring substance and while yes, it is toxic, a very large amount would have to consumed. The small amount in this craft isn’t enough to cause damage, but I would not suggest having it around small children who could possibly ingest it. We make slime for Mad Science all the time, and NEVER let anyone under 5 make it. The combination of the chemicals in the glue and the Borax isn’t lethal, but can definitely make kids very sick if they ingest it. You can use liquid starch instead of the Borax to make it slightly more kid friendly (still not good to eat, but less bad if they do eat it). Also, we use tempura paint instead of the food coloring (lighter colors, but less staining). Boric acid and borax are not the same thing, although they are related. Boric acid can be toxic, borax usually not and used in all sorts of ways, including in food. 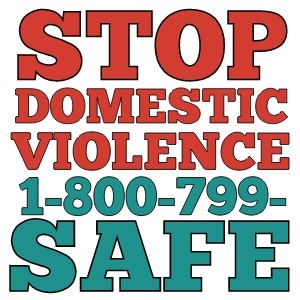 Google both and check out the information on the Wikipedia sites and I believe that will calm your concerns. My daughter would have a blast with this stuff! This is FABULOUS! I’m so doing this with my daughter later! How awesome! Would love it if you came by and linked up to my Manic Monday Linky Party! My boys and I made it this afternoon and they loved it!! We made two, both clear, one with red coloring and glitter and one with blue coloring and glitter. They look SO cool! The boys sat at the table for over an hour and played with it. We’re storing them in old glass jars and they look amazing. Thanks for the glitter tip!! Thanks for the idea! Cheaper than buying it! And so fun! 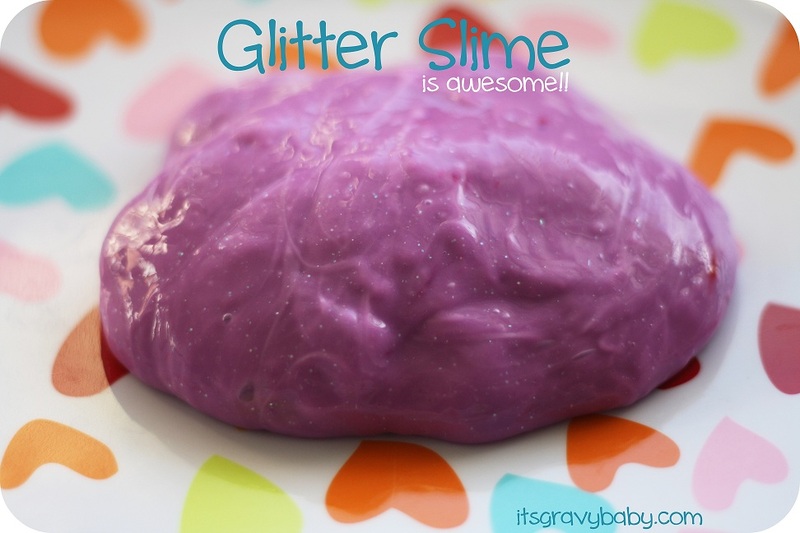 We will be making glitter slime next week! Thanks for the recipe! You are very welcome. Have fun & enjoy! How much elmer’s glue do you need for this recipe? How about for a classroom of 2 kids. How much does a batch make? Would 2 batches be enough? Another teacher & myself made this for an event at our school a few years ago, I had forgot about it. I just don’t remember how much a batch makes. Sorry I’m tired. I have 20 kids in y room. I would probably make 4 batches to be on the safe side. In the photos above, the red is one batch and the purple is another batch. Hope that helps! How could I let each kid make there own. For the valentine’s day party. How much glue would I use? And how much borax in water? Thank you so much for the comparison between the clear and the white glue, that was exactly what I’d been trying to figure out 🙂 Can’t wait to try this for Halloween! 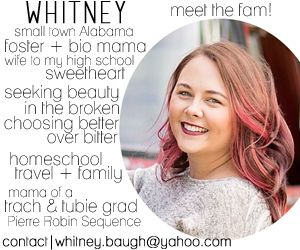 I absolutely love all of the crafts I see on your page. I have tried this and my kids absolutely love it. this is perfect for me to do with my little cousins…thank you for sharing…i love the glitter one. I didn’t realize it was this easy to make and we buy it often for my grandson. He is vacationing in Florida for the week, this would be great to make and surprise him when he gets home. Thanks for sharing! great craft idea – i would never have guessed that glue would be one of the ingredients! Thank you for this slime recipe. I am going to give it a try. I will have to go to a bigger store to find the glue because I haven’t seen it locally. But this would be so much fun to play with for the kids. 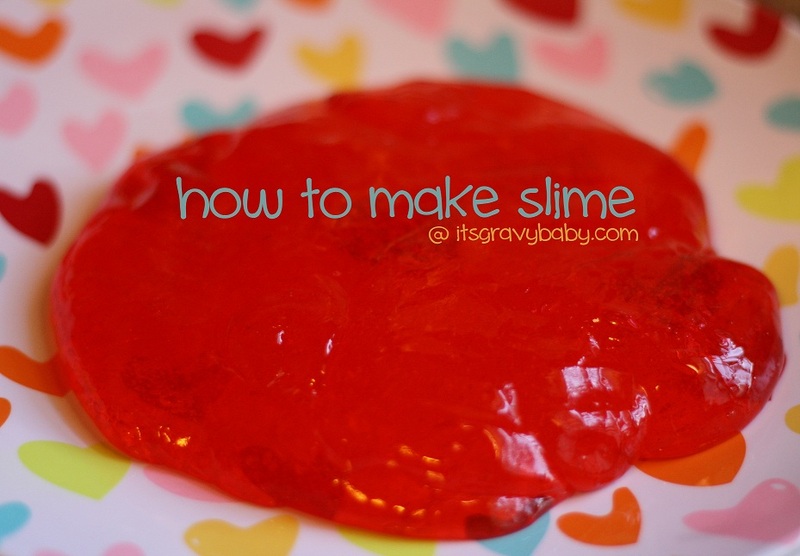 I am hosting a Halloween party for my pre schooler and her friends and this slime will be the hit of the party – thank you so much for sharing how to make it. We made glow in the dark slime last night – my 4 little ones had a blast and I continued playing with it long after they fell asleep!! I have made this the last 3 years for my daughters school carnival, we made a game called nose pick the kids love it but the parents thinks is gross!!!! They pick the nose and get slime or a prize!!! What a great idea! It is one of the creative ways to remove boredom and your kid’s will surely enjoy this wonderful idea. 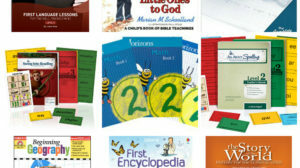 This is a special and a unique personalized gift which could be gifted to your little ones. How much of everything do u use?? 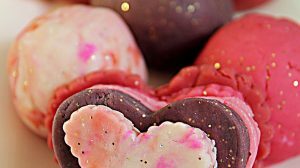 You make cool slime such as hearts for Valintines Day and you are very creative. Also You chang the way i work and the way i make slime.So keep up the good work and follow your dreams. Penelopevallejo2@gmail.com I this a Penelope and I am a kid I love to make slime so thank you for teaching how to make slime it my first time making it.